These burgers have great flavor and are easy to make with ingredients that you should have around your kitchen. Combine the canola oil, the onion, the garlic, and the sea salt in a saucepan. Cook on medium heat for two minutes. Add the tomato paste, the water, the Worcestershire sauce, the hot sauce and the balsamic vinegar. Turn the heat down to low. Cook while whisking for three minutes. Refrigerate for at least 45 minutes before serving. Combine the onion, the canola oil, a pinch of sea salt, and a pinch of black pepper in a sauté pan. Cook the onion and canola oil on low heat for five minutes stirring frequently. Combine the cooked onion, the ground beef, the garlic powder, the Worcestershire sauce, the mustard powder, a teaspoon of sea salt, and a ¼ teaspoon of ground black pepper. Mix well. Form the meat mixture into six equal patties. Cook the patties on a hot gas grill for five minutes on each side turning them only once. Add the cheese to the top of the burgers and close the lid. Cook for an additional two minutes until the cheese has melted. Remove the burgers from the grill. Put the rolls on the grill cut side down. Cook for not more than a minute. Place the burgers on the rolls and serve them with the homemade ketchup. Into a Dutch oven, add the flour and the vegetable oil. Put the pot on medium heat. Start by whisking the flour and the vegetable oil to get out any lumps. Continue to cook the mixture while stirring constantly with a wooden spoon until it takes on a peanut butter color. This process will take about twenty minutes. Turn the heat down to low. Add the diced onion. Cook while stirring for three minutes. Add the andouille sausage, the celery, the green bell pepper, the garlic, the parsley sprig, the bay leaves, the cayenne pepper, the sea salt, the Worcestershire sauce, and the hot sauce. Cook while stirring for four minutes. Turn the heat up to medium high. Add the seafood stock. Stir the mixture well while continuing to cook for about four minutes. The sauce will be fully thickened once it begins to boil. When the mixture begins to boil, reduce the heat to low. Taste and add more sea salt, cayenne pepper, and/or hot sauce, if desired. Cover the pot and simmer while stirring occasionally for 40 minutes. Add the potatoes after the stew has simmered for 40 minutes. Continue to simmer until the potatoes are fork tender (meaning a fork can pierce the center of a piece of potato easily). Taste and add more sea salt, cayenne pepper, and/or hot sauce, to taste. Add the shrimp. 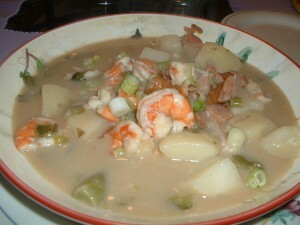 Cook the stew uncovered for an additional ten minutes until the shrimp turn pink in color. Serve with white rice. Garnish with the chopped scallions. This dressing will keep in the refrigerator for at least two weeks. Combine the garlic, the ginger, and the sea salt in a mixing bowl. Mash the garlic and the ginger with a fork to form a paste. Add the brown sugar. Mash again. 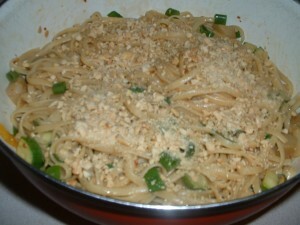 Add the Sriracha sauce, the peanut butter, the juice of the lime, and the soy sauce. Whisk well. Add the canola oil and the sesame oil. Continue to whisk until the mixture is smooth and well blended. Combine the garlic, the ginger, and 1/2 teaspoon of sea salt in a large pasta bowl. Mash the garlic and the ginger with a fork to form a paste. Add the brown sugar. Mash again. Add the Sriracha sauce, the peanut butter, the juice of the lime, and the soy sauce. Whisk well. Add ½ cup of canola oil, a tablespoon of sesame oil, and the water. 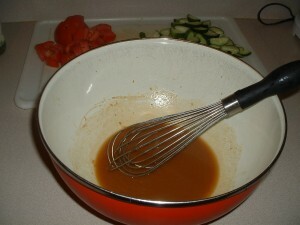 Continue to whisk until the mixture is well blended. Set the bowl with the sauce aside. Add ½ teaspoon of sea salt, the crushed red pepper flakes, a tablespoon of canola oil, and a teaspoon of sesame oil to a 12-14 inch non-stick sauté pan. Put on medium high heat for three minutes. Add the eggplant, the zucchini, and the bell pepper to the hot oil. Cook the vegetables while stirring frequently for 5 minutes. Turn off the heat. In the meantime, cook the linguine in a pot of salted, boiling water according to the package instructions. Drain the pasta well in a colander. Add the drained linguine to the pasta bowl with the sauce. Mix well. Add the zucchini, the eggplant, and the bell pepper. Mix again. 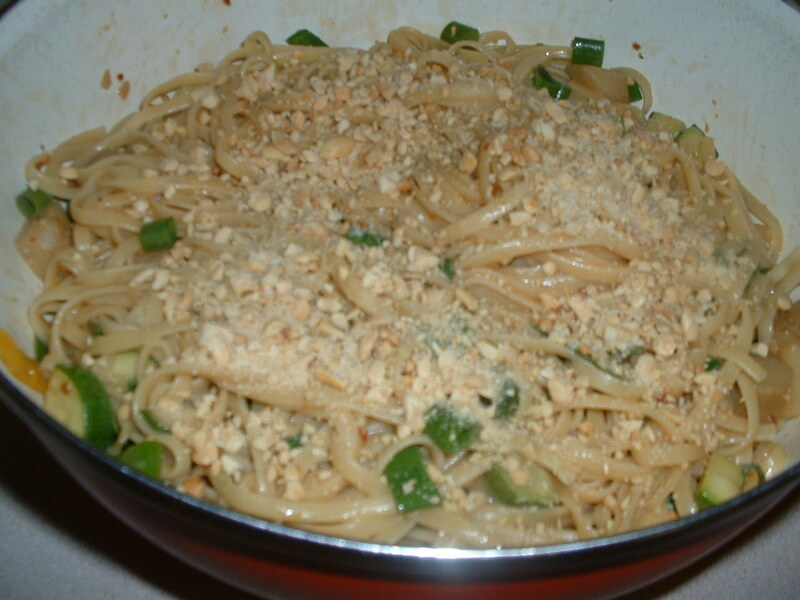 Garnish with the chopped peanuts and the scallions. Serve at once. Take advantage of summer’s bounty of corn and tomatoes with this fresh tasting salad. Brush the ears of corn evenly with a tablespoon of canola oil. Sprinkle the corn with a ¼ teaspoon of sea salt and ¼ teaspoon of black pepper. Wrap the ears of corn in aluminum foil. Roast the corn in the preheated oven for 30 minutes. Let the corn cool. Cut the kernels of corn off of the cobs by moving your chef’s knife lengthwise from top to bottom. Use the flat part of the cob as your base. Set the corn kernels aside. Combine the garlic, the red onion, and ½ teaspoon of sea salt in a large salad bowl. Mash with a fork to form a paste. Add the cumin, the chili powder, the jalapeno pepper, and the lime juice to the bowl. Whisk well. While whisking, slowly drizzle in the canola oil. Continue to whisk until the dressing is well blended and thickened slightly. Taste and add more sea salt, if needed. Cook the orzo in a pot of boiling, salted water according to the package instructions. Drain the pasta well in a colander. While the pasta is still hot, add it to the bowl with the dressing. Mix well. Add the corn and the tomatoes. Mix again. Let the salad sit at room temperature for at least 60 minutes before serving. 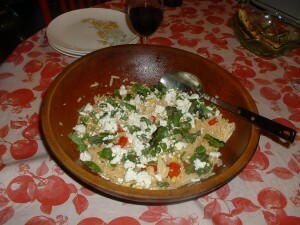 Just before serving, add the cheese, the chopped scallion and the shredded basil to the top of the salad. Place the eggplant on a sheet pan. Brush the eggplant slices uniformly with a tablespoon of olive oil. Sprinkle the eggplant with ¼ teaspoon of sea salt and ¼ teaspoon of black pepper. Roast in the preheated oven for 15-20 minutes until the eggplant is browned slightly. Allow the eggplant to cool and then cut the eggplant slices into about one inch long, ½ inch wide strips. Combine the roasted red peppers, the tomatoes, the garlic, the crushed red pepper flakes, ½ teaspoon of sea salt, two tablespoons of olive oil, and the basil leaves in a food processor. Pulse until smooth. Taste and add more sea salt and/or crushed red pepper flakes, if desired. Spread the red pepper pesto evenly in a thin layer on the naan breads. Note: you do not have to use all of the pesto. Place the eggplant strips in equal amounts on each pizza. 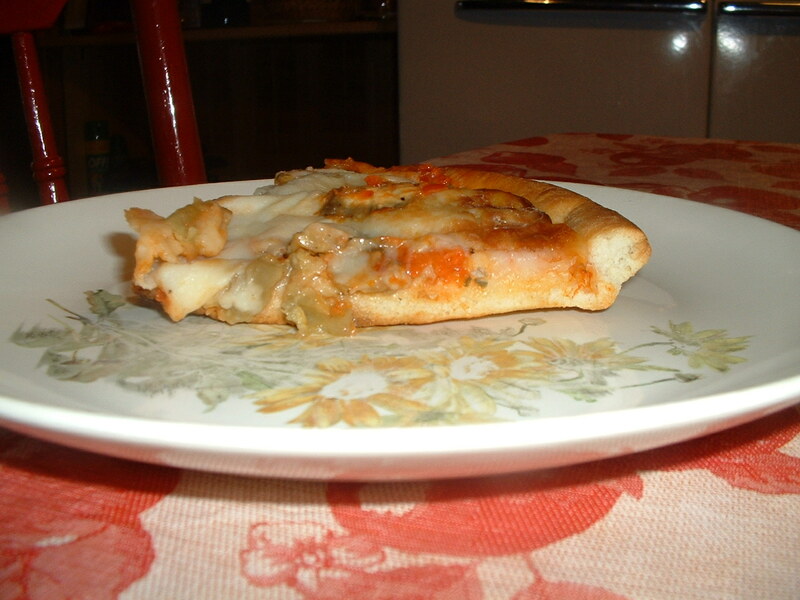 Top the eggplant with the provolone cheese (four per pie). Bake in a preheated oven set at 375 degrees for 15 minutes until the cheese becomes bubbly. Allow the pizza to cool for 10 minutes before slicing. 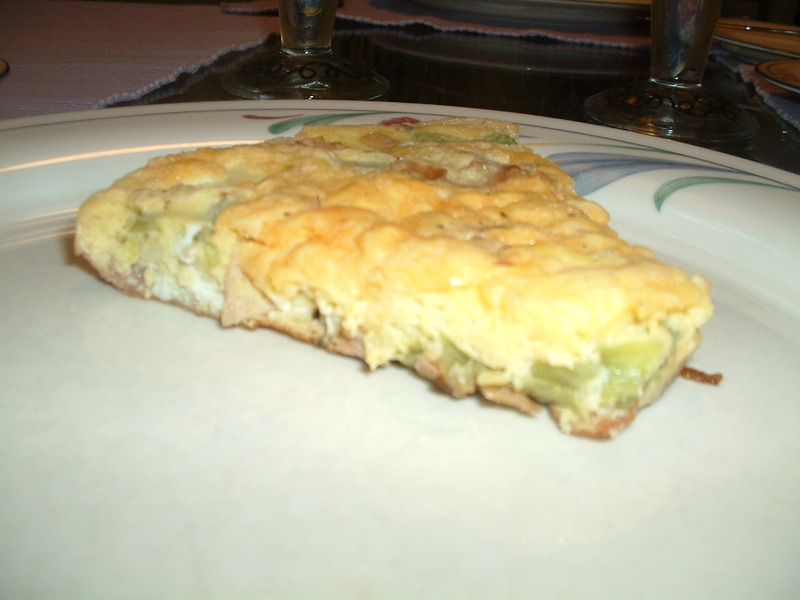 I conceived this recipe when I decided to use up leftovers that were in my refrigerator. I had some baked Virginia ham, some chopped onions, and some cooked broccoli that I did not want to waste. Combine the beaten eggs, the cheddar cheese, the black pepper, and ¼ teaspoon of sea salt in a bowl. Mix well and set the egg mixture aside. Into a 12-14 inch non-stick sauté pan, add the olive oil, the red pepper flakes, ¼ teaspoon of sea salt, and the diced onion. Cook on medium high heat while stirring frequently for three minutes. Add the garlic, the ham, and the broccoli. Stir well and then spread out the mixture evenly in one layer. Add the egg mixture. Continue to cook on medium high heat until the edges begin to set. Place the pan in the preheated oven. 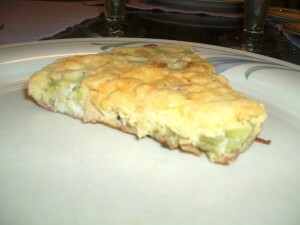 Bake for 15-20 minutes until the eggs are firm to the touch in the middle. Combine the water, the brown sugar, and the sea salt in a large bowl. Whisk well to dissolve the salt and the sugar. Add the pork chops, the fresh thyme, the red onion, the garlic, and the black peppercorns. Place the bowl in the refrigerator. Refrigerate the pork chops in the brine mixture for at least one hour before cooking. When you are ready to cook them, pat the pork chops dry with a paper towel. Apply the spice rub equally on one side of each pork chop. Cook the pork chops on a hot gas or charcoal grill for 5 minutes on each side. 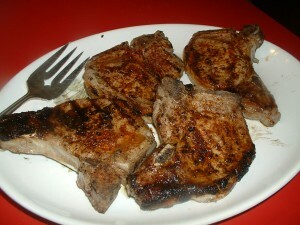 Allow the pork chops to sit at room temperature for 5 minutes before serving. This classic dressing is great on sandwiches or salads. Combine all of the ingredients in a mixing bowl. Mix well. Refrigerate for at least one hour before serving.